Pressure often comes from the disparity between expectations and reality. We can limit this disparity by limiting the perceived ups and downs that come with most projects. Here are some tactics for managing pressure by smoothing out the ups and downs. See "Managing Pressure: Communications and Expectations," Point Lookout for December 13, 2006, and "Managing Pressure: The Unexpected," Point Lookout for December 20, 2006, for more. 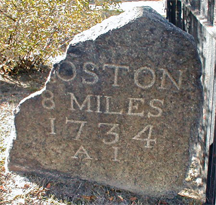 In 1763, while Deputy Postmaster General, Benjamin Franklin measured distances from Boston along the Boston Post Road. Workers following him erected milestones at each mile point. Pictured is is an earlier milestone in Cambridge, Massachusetts. It's common practice to divide project timelines into uneven segments distinguished by milestones, with some milestones identified as "major." This practice can undermine perceptions of progress, because people prefer steady forward progress to an uneven stream of equal-sized steps forward. This is true even if the achievements vary greatly in significance. Spacing milestones unevenly creates progress perception problems. To manage perceptions, let go of the distinction between kinds of milestones. Have more milestones, and space them fairly evenly. Gaps between milestones just prior to a delivery are especially costly, because they engender anxiety about a lack of real evidence that the project is healthy. Anxiety increases if preparations are underway for receiving the delivery. Idle time creates fear. Choose milestones that provide news during parts of the schedule when people might be susceptible to fear. Even when a schedule has evenly spaced milestones, customers, sponsors, and management can become anxious when the project delivers usable capability at irregular intervals. Milestones that don't "matter" to the customer have little positive impact on perceptions of progress. The psychological reason for this may be related to airline passengers' aversion to itineraries that have legs in them that go the "wrong way" even when those itineraries are faster. Milestones that don't "matter" represent cost and schedule without real progress. Schedule regular milestones that have customer impact. them fairly evenly.the deliverables into ongoing operations can affect the customer's perception of the quality of the deliverables. And anxiety about the coming chaos is often reflected in perceptions of progress. Even deliverables that are 100% compliant with requirements will take the blame for internal difficulties in incorporating them organizationally. Do whatever you can to make incorporation easy. Automate any required conversions and prepare for transition training and help. These efforts are most effective if they're in the plan from the beginning, but add them later if necessary. As a sponsor or a senior manager, you're uniquely positioned to smooth out the experience of these ups and downs. Establish review processes that ensure that these pressure-management strategies are used throughout the organization. Project plans should have evenly spaced, frequent milestones that deliver real value early and often. And establish after-action reviews for projects that recently passed through crises to enable project team learning. Would you like to see your comments posted here? rbrengnkzdidNZRKatAudner@ChacUxoIEtMxXgwtyUJpoCanyon.comSend me your comments by email, or by Web form. I offer email and telephone coaching at both corporate and individual rates. Contact Rick for details at rbrenpZBowMEXjDopGuUVner@ChacMoxcWUnhjGchoGSkoCanyon.com or (650) 787-6475, or toll-free in the continental US at (866) 378-5470.